Number of Occurrences Before Alert: The number of consecutive metric collections where the alert threshold is met, before an alert is raised. 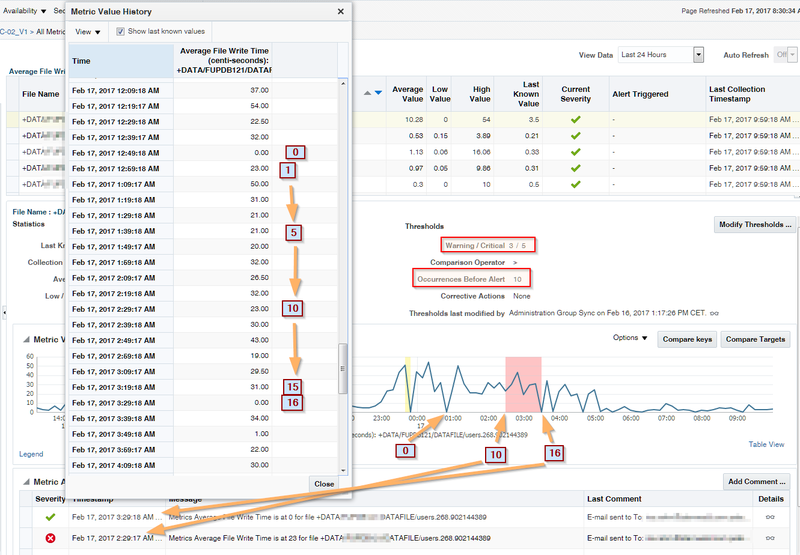 The following screenshot visualizes such an example for Incident Manager where file write time metric warning and critical thresholds and occurrences have been adapted (for boringly slow systems, the times in centisecs! ), lowering the probability of alerting during higher workloads. Regard the “Metric Value History” popup window, brought up by the “Table View” link, that shows the agent probing timestamps, every 10 mins, resetting any previous alert status through an actual metric value of 0, at 12:49:18 am wall clock time, step #0. From there on up to step #10, the given critical threshold has consistently being violated, triggering (and persisting) the alert as well as sending out an email notification. The alert status persists being critical throughout step #15, until in step #16, the alert status will again be reset, clearing up and yet sending out another email. The graph control shows that nicely in light red. It also shows a period of another alert status, only at a warning level this time, just before last midnight, in yellow. A well done, comprehensible representation, I like it.